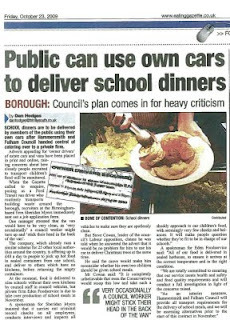 The Cowan Report: Are H&F Conservatives Taking The Proper Precautions With Our Kids’ School Meals? Yuk. What guarantees are there around hygiene? What about virulent types of e-coli? Are these people police checked? This is madness. I will be giving my child packed lunches and writing to the school to complain. The Conservative Party has lost my vote. There is too much of this nonsense going on here locally. The Conservative Party will lose next Council Election.